I love honeyburst finishes! Just don't see many Custom Shop honeybursts though. But what really grabbed my attention here is the super straight wood grain pattern. I can't quit looking at it. The last burst I saw with grain this straight was a sugar pine body by LSL, though it was much tighter and fine like a spruce top. But could this be pine? Fender CS has done some 100 year old pine Strats, but solid finishes so you don't see the grain. Not much specs-wise here. The 100% seller has lots of good feedback, photos and other hi-end listings, but little description. 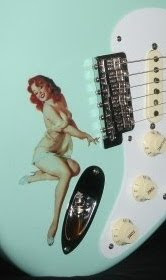 This Strat is listed as "unplayed", and a zoom/click on the COA pic shows 10/20/11, so it's basically new. All candy and case are there, and frets appear on the jumbo side.